The aim of the present contribution is to analyse the orientation of Etruscan temples in order to understand whether they followed a certain ratio or whether they were randomlyoriented. After a critical analysis of the data from azimuth measurements, an attempt is made to understand whether this ratio could depend on factors that are of ritualistic character, possibly linked to the sky and precepts of the Etrusca Disciplina which are known to us. In undertaking this study, the author has decided first to give a brief summary of previous studies on the present subject. In the final section of this paper, the author presents the data (collected in a series of field visits during the year 2013) pertaining to the azimuths of Etruscan temples, and furthermore makes some comments on the data analysis and its significance. This contribution is part of the research project I am carrying out within the framework of the ‘Tarquinia Project’ of the Università degli Studi di Milano, designed since its beginning to carry out global archaeological, cultural and historical research. The project started in 1982 when Maria Bonghi Jovino began the excavations in one of the most ancient Etruscan sanctuaries, currently known as the ‘monumental complex’ and in the Ara della Regina sanctuary (Tarchna I 1997; Tarchna II 1999; Tarchna III 2001; Tarchna IV 2012). Over the past 10 years Giovanna Bagnasco Gianni, the present Director of excavation and research, has involved groups from the Università degli Studi di Milano and the Politecnico di Milano in order to gather more information about one of the most important aspects of Etruscan civilization, which is the design of space in accordance with the norms of Etruscan religion. In order to try and interpret such an invisible aspect by means of archaeological remains, cooperation with Giulio Magli started in 2012 and led to a first contribution on the orientation of the altar of the Ara della Regina sanctuary (Bagnasco Gianni et al. 2013). 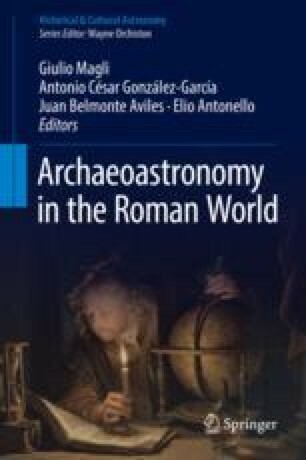 In the same year I started my research on the material aspects of the Etruscan sanctuaries from the point of view of the archaeoastronomical information given by the ancient Greek and Roman literary sources, which I am going to present in this paper.